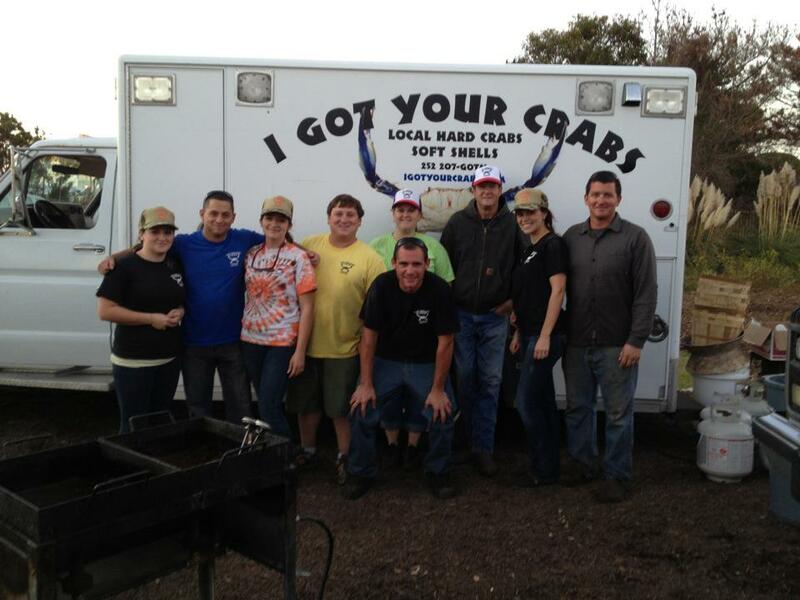 Since I Got Your Crabs is a family owned and operated business, it probably doesn’t surprise you that we’re a close family. What may surprise you, however, is that this restaurant was inspired by the family member who made us all so close – April. 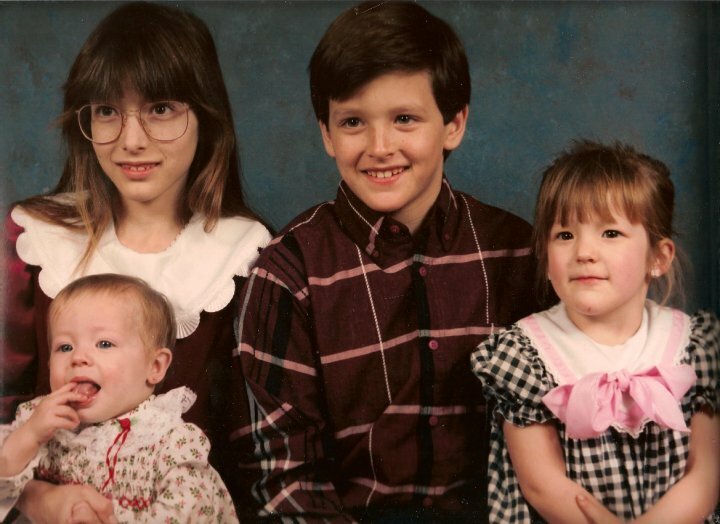 April, the oldest of four children, was a beautiful, intelligent, and charismatic young woman. You could always count on her to tell it like it was and leave you with a smile. Despite being born with cancer, she accomplished many goals that most others only dream of. She graduated as the valedictorian of Currituck County High School in 1996, studied abroad in Europe before graduating from Wake Forest University, and completed a law degree at Mercer University Walter F. George School of Law. Unfortunately, April passed away at the age of 25 due to complications from childhood cancer. Since her death nine years ago, we’ve all felt it necessary to celebrate her life and honor her memory. Hunter’s way of doing that was dedicating this restaurant to his sister. You’ll find several treasured items in the dining area including the large quilt displayed over the booths. April sewed the quilt at only twelve years of age and won many awards for her talent. The “CRABGIRL” license plate was also April’s during high school. Her parents convinced her to change it when she went away to college knowing that those not familiar with blue crabs might misconstrue the nickname. We all miss April dearly and can’t express how much she changed our lives in the short time we spent with her. When we think of April, there are always smiles instead of tears because we’re thankful for her beautiful life. She’s our daily reminder to cherish each day and live it to the fullest – just like April. Last week a friendly couple from Michigan stopped in to eat with us – we’ll call them Mr. and Mrs. Michigan. Vacationing with four teenagers, they had decided to take a night for themselves. We’re so flattered that they chose to spend that time with us. It was truly our pleasure to chat with them and share the local delicacies. The couple enjoyed several menu items including blue crabs and steamed oysters. At the end of their meal, I was even charmed into cleaning up an oyster shell for them to take home as a souvenir. As I met them at the register, Mrs. Michigan was playfully shushing her husband as a spouse might do to avoid embarrassment. Intrigued, I asked for them to share with me. To my delight, Mr. Michigan ignored the shushing and let me in on their secret conversation. It turns out that the two had gone back and forth about eating at I Got Your Crabs. A local had recommended us to them but Mrs. Michigan was skeptical. Understandably, she wasn’t sure about dining at a restaurant in a strip mall with such a silly name. She had only agreed because Mr. Michigan kept insisting that little “hole-in-the-wall” places were usually the best kept secrets. When he finished telling the story, Mrs. Michigan quickly admitted that she had been wrong to protest because she’d thoroughly enjoyed her dinner and our company. To Mrs. Michigan’s relief, I assured her that we weren’t offended because we’re used to skeptics. She’s definitely not the first person to admit that our location almost kept her from dining with us. We’d have to agree with Mr. Michigan, though; we’re proud to be a local “hole-in-the-wall” that’s constantly surprising skeptics. If a similar sentiment has been stopping you or a friend from dining with us, stop by. We’d love to prove you wrong! A few classic, food pairings go together so well that it feels wrong to enjoy the parts separately. In that sense, shucked shellfish & cheap beer are right up there with peanut butter & jelly. We’re so passionate about the combo that we’re going to celebrate it twice a week. Intrigued? Read on. You guys have made it clear that you love your favorite beer with hot crabs and fresh oysters. Do you often find yourself wondering how that meal can get any better? We know how – cheaper beer! Starting this week, we’ll be offering all beer varieties for just $1.50 on “Football Funday Sundays” and “Pop a Top Tuesdays”. If you’re as excited about this as we are, then we know we’ll be seeing you every week. Join us this Sunday for the very first Football Funday Sunday. Bring your appetite! As an added bonus for visiting our blog, we’ll let you in on a little secret. Rumor has it that live music is in the works for an upcoming Pop a Top Tuesday. Stay tuned for details! In the wake of one of the largest hurricanes in modern history, we’re simply amazed by all of the support and encouragement that has been extended to us. For those who don’t know, our beloved restaurant began taking on flood water from hurricane Sandy on Monday, October 29, 2012. We moved a few things to higher ground but were otherwise defenseless against the rising water. It was disheartening to know that there was absolutely nothing we could do as we headed home to ride out the storm. We stopped by the restaurant again on Tuesday morning armed with extra helpers in hopes that the water had receded enough to begin cleanup. Unfortunately, we discovered that the flooding had only worsened. It set in then that we would lose much of our product long before we were operational again. Instead of discarding it immediately or letting it spoil, we decided to share the feast with our helpers and other passersby. We moved one of our picnic tables to a shallow area and began to chow down. What started out as lunch among friends, quickly spiraled into something we never could have imagined. We posted this picture to our Facebook page hoping to bring some humor to an otherwise disastrous situation. In a very short time, the photo went viral. It received a shocking amount of attention on Facebook and other websites, like Imgur and The Chive, as well as from local news channels. People have reached out to us from all over the country. Our spontaneous meal seemed to be the just kind of lighthearted aftermath that so many sought amid thousands of heartbreaking photos. Along with the attention came numerous offers of help from local businesses and friendly patrons alike. It’s obvious to us now that we’re not in this alone. We know that over the next few weeks, there will be plenty of helping hands to get us back on our feet. For that, we are grateful beyond words. 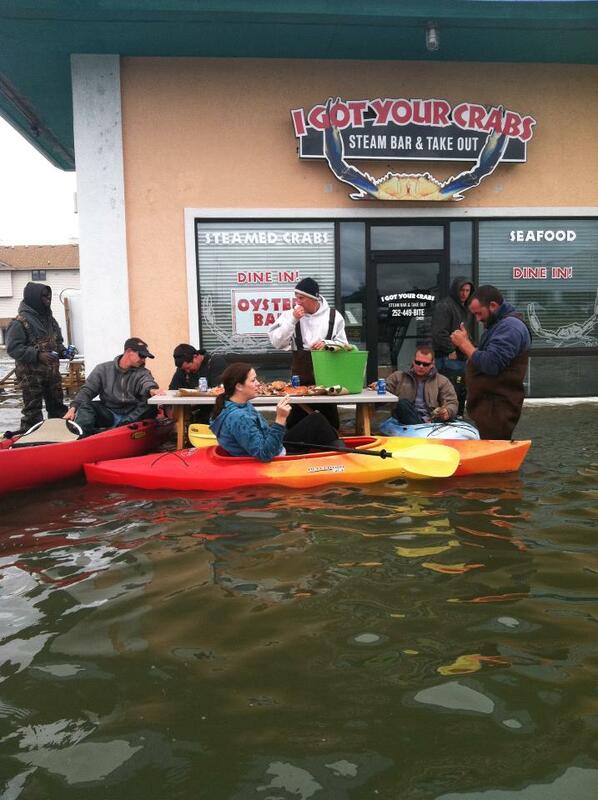 We’re truly in awe of the resilient community spirit that defines the Outer Banks. As you begin to pick up the pieces in your own neck of the woods, you’ll undoubtedly grow hungry. Save that big appetite for our grand re-opening because it will be an event that you don’t want to miss. We’ll be back in business as soon as possible, and we have more motivation than ever to feed our community. First off, we’d like to thank everyone who came out on Saturday to support I Got Your Crabs and local seafood in general. If you didn’t make it to the Outer Banks Seafood Festival this weekend, you sure missed out. The crowds were unprecedented and the hospitality impressed us! No matter how long our line got you guys were excited to be there and had hungry bellies to fill up. I must admit that we were a bit nervous as the seafood festival was our first vending adventure outside of our restaurant. To say that it was a learning experience is an understatement but the event turned out wonderfully. We were so happy to serve you some of our best dishes while enjoying the perfect weather overlooking the Roanoke Sound. 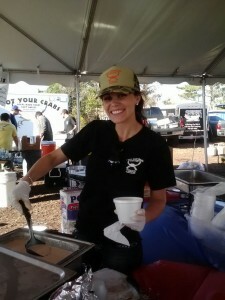 Even one of the owners pitched in as Soup Scooper! To show our appreciation, we ended the day by giving away free crabs! It was certainly a day that we will never forget and it’s something we’ll look forward to every year. 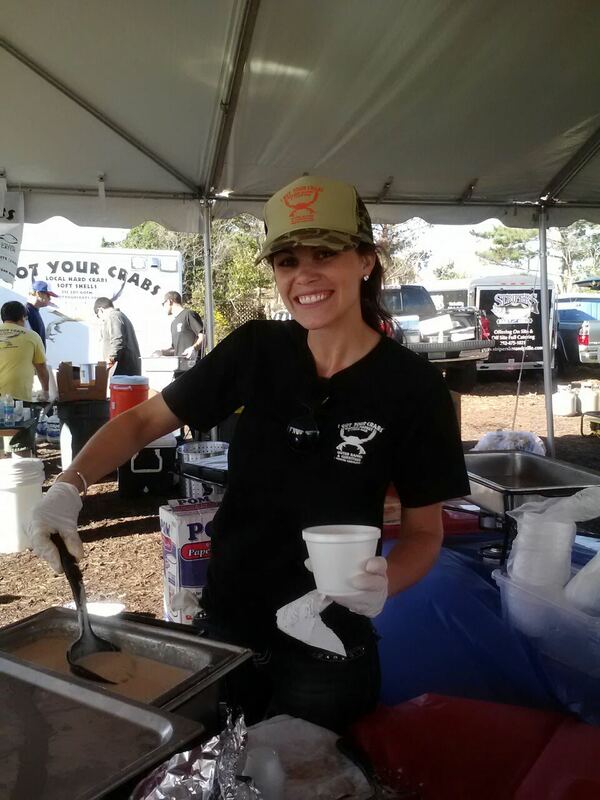 If you didn’t get a chance to sample our food at the festival or just want to eat it again, visit our restaurant in Kitty Hawk. We can’t wait to feed you! You’ve all been waiting patiently in anticipation of oyster season and it’s finally here! Don’t be fooled by others who’ve had oysters for a few weeks now. We were waiting until the local oysters were good and salty until offering them. Let me tell you – they were worth every second of the wait! Every single oyster we sell, regardless of how it’s prepared, is freshly shucked right here in our kitchen. We never use pre-shucked oysters. 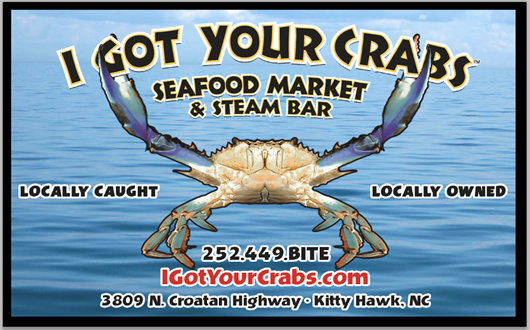 It’s just one more way that we’re committed to bringing you the freshest seafood on the Outer Banks. Each oyster is cooked to your liking whether it be raw, steamed, or fried. Our oysters are available by the dozen, peck, half bushel, or bushel to satisfy all appetites. Of course, cold beer is waiting for you to enjoy while we shuck for you. 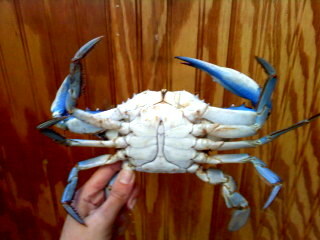 As an added bonus, we’ll have both blue crabs and oysters for a few more weeks. If you like seafood, this is definitely the place to be. 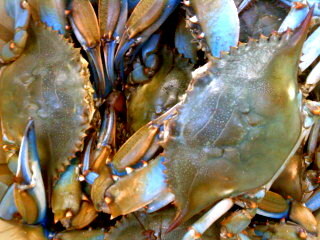 We’re often asked where we get our blue crabs from and what we mean by “local”. If you know the family or have been following us online, then you already know that the owner if I Got Your Crabs Steam Bar catches the crabs himself. This means that there’s no middle man between you and our commercial fishing boat. That’s how we’re able to offer the freshest seafood at such reasonable prices. By “fresh”, we mean straight out of the Currituck Sound. In case you’re unfamiliar with local waters, the Currituck Sound is the large body of brackish water that separates the mainland from the northern Outer Banks. You drive over it when crossing the Wright Memorial Bridge to get to the beach. Each time you cross the bridge, look out over the water and think of all the yummy, blue crabs swimming just below the surface. Then drive 4.5 miles further, look for us on your left in a strip mall next to Papa John’s, and stop in to dine on the local delicacy. We’re waiting for you! Since it’s officially fall and the air is cooling off, we thought we’d take a minute to talk soup with you. Soup is the perfect meal or appetizer when you’re looking to warm up a bit and shake that autumn chill. We’re open year-round so we included several soups on our original menu hoping to change them quite regularly. We didn’t plan on our She Crab Soup having a following of its own. So many of you stop by just for the soup or get an extra to go because it’s so delicious. Our employees often eat it for lunch and one employee in particular, our cook, gets quite a bit of praise for it. He makes the dish from scratch each morning without a recipe or notes of any kind. Impressed yet? You’re not alone. We love it so much that we’ve yet to change the “soup of the day”. We’re happy to say that change is coming! With oyster season quickly approaching, you can look forward to our fresh, oyster stew. Don’t worry though, the She Crab Soup is here to stay. If you haven’t tried it yet, stop in to see what all the hype is about! Fun Fact: Have you ever wondered how She Crab Soup got its name? We did too! We did some research and it turns out that traditional recipes included the orange roe (or eggs) found on some female crabs. The phrase, however, has come to describe any cream-based soup that contains blue crab meat. Because our family has been commercially fishing local waters for three generations, eating blue crabs is second nature to us. It’s always been a part of our lives so we’re amazed when customers come in that have never eaten or even seen a blue crab. 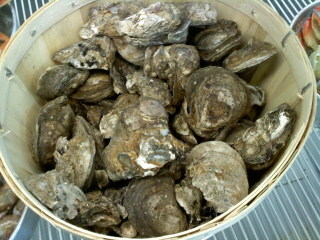 While we offer to shuck them at no additional charge for all dine in customers, the beginners are our favorites. Watching someone get the hang of it and then enjoying the fruits of their labor is rewarding both for us and for them. If you’ve not yet had the chance to shuck crabs for yourself, we’ve put together this video to show you how. We break it down into steps and show you what is and isn’t edible. I have to admit that I’m pretty jealous that you’re getting inside secrets right from the start. When we were too young to remember, our father literally handed us a crab and said “eat what tastes good and spit out what doesn’t”. 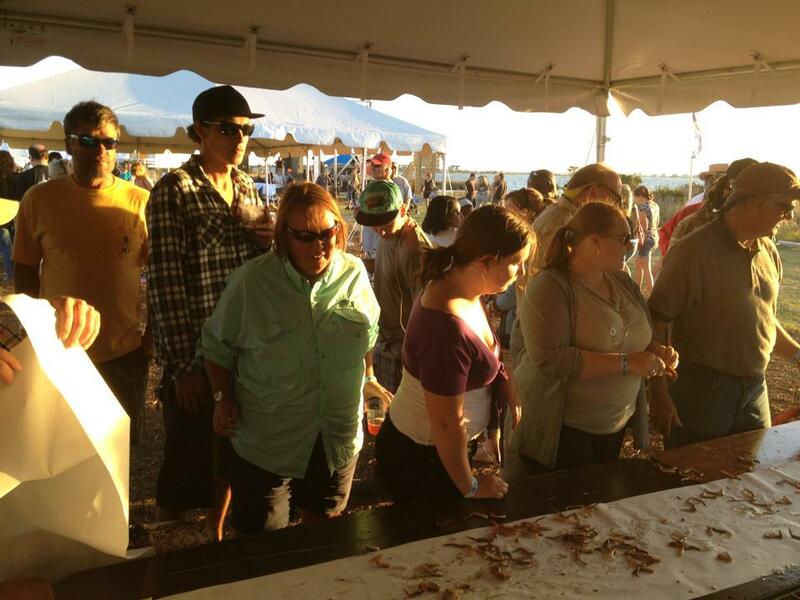 At the end of the day, watching others do it and “eating what tastes good” is the best way to learn how to eat local blue crabs. 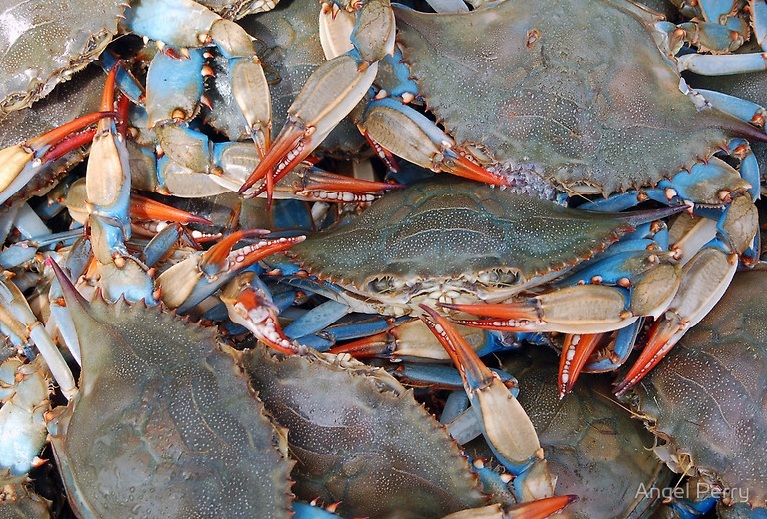 Because our special $24.99 half bushel of blue crabs contains both males and females, we’re often asked questions about the differences between the two. Keep reading to find out why some people may have a preference for one gender over the other. Let’s start by taking a look at their physical differences. 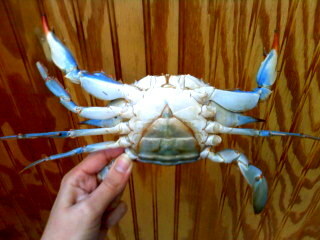 There are two ways to identify your crab as being either male or female including claw color and apron shape. First, take a look at the crab’s claws. Male crabs will have bright blue claws like the first picture below. Female crabs, however, have red tips on their claws like in the second picture. It’s easy to remember this distinction because, like humans, the females wear “red nail polish”. A second way to tell the difference between males and females is by the shape of their “apron”. If you look at a crab’s underside, there’s a flap with a distinct shape. This flap is referred to as the apron. 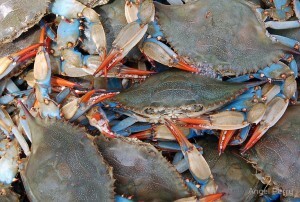 Male blue crabs (Jimmies) have a long, pointy apron as seen in the first picture below. Mature females (Sooks) have a rounded apron as in the second picture below. You may also see crabs with triangle-shaped aprons. These are immature females and are called “v-bottoms”. Still wondering why some prefer one over the other? Those who prefer males often do so because catching females is controversial in other some other states. Some states do not permit fishermen to keep females. Don’t worry, though! It’s perfectly legal in North Carolina to keep and sell females because populations are plentiful here. Those who prefer females usually claim that their meat is sweeter. We want your opinion on it! Come try our special half bushels, use this guide to find a male and a female, and let us know if you can taste the difference in their meat.